The largest organ of the human body and one of the most important (adult skin covers about 18.2 sq. feet and weighs approximately 6 pounds), the skin is a complex structure that protects and regulates the delicate tissues and systems of our body. THE EPIDERMIS is the surface of the skin and protects the delicate tissues of the body from injury. The protective ability is due to a substance called KERATIN. The soft Keratin of the skin is a protein that occurs in the form of flattened cells or as dry scales. THE DERMIS is the layer of skin just below the epidermis, also referred to as the true skin. The dermis is made of 70% collagen fibers. COLLAGEN is a form of protein and it gives the skin strength, form, flexibility. Collagen forms a network of microscopic interwoven fibers that gives the skin structural support to hold blood vessels, fat cells, oils and sweat glands together. It allows for stretching and contracting and aids in the healing of wounds. The elasticity comes from ELASTIN which fills the space in between the fibers. MOISTURE IS IMPORTANT for keeping the collagen network supple. The deteriorating condition of the skin’s collagen is what causes wrinkles and sagging to occur, when the collagen fibers loose their flexibility, and not the condition of the facial muscles. A healthy skin is slightly moist, soft, flexible; possesses a slightly acid reaction; it is free from disease or disorder. The skin has immunity responses to organisms that touch it or try to enter it. Its texture (feel and appearance) ideally is smooth and fine grained. The texture of the skin is made up of indentations in the skin: pores (the openings for hair follicles) and 2 types of glands: sebaceous glands, and sweat glands (oil and sweat). Sebum from the oil gland (in the hair follicle) lubricates the skin and helps prevent the evaporation of moisture. Sweat helps to regulate the temperature of the body. Aside from their intrinsic functions, pores represent a route of entry into the skin. This vulnerability is protected by the acid mantle. The secretion of oil and sweat mix on the surface of the skin to create the pH balance or the skin’s protective mantle. The skin’s protective barrier has a normal pH of 5.6-6.6. Physiologically, skin care begins with the acid mantle, predominantly composed of sebum; it is our natural defense barrier on our skin’s surface. Every time you bathe you must replenish and restore the acid mantle of your skin after cleansing to protect your skin. THE SKIN IS NOURISHED by blood and lymph supplied through circulation. They contribute essential materials for the growth, nourishment, and repair of the skin. Topical skin care can directly stimulate circulation in the skin to activate the skin’s natural healing system. Natural openings in the skin (glands and pores) allow for evaporation and substances to be absorbed into the skin. The skin is permeable and able to absorb what is applied to its surface. Therefore, it is paramount to use natural body products that are beneficial for good health and hygiene. maintains its moisture level by the secretion of sebum which coats its surface. The layer of oil slows down the evaporation of water from the skin and prevents excess moisture from penetrating into it. Your skin prefers something that is similar to the sebum that it manufactures on its own; botanical oils and essential oils are the answer. All SKIN TYPES: oily, normal, and dry are nourished by appropriate botanicals and essential oils. AGING: Taking care of the skin should start at an early age. Once the skin has been neglected it is more difficult to improve its appearance or undo the damage. The skin shows signs of aging faster than any other organ in the body. As the body’s protective covering, the skin is vulnerable to attack and is subject to daily wear and tear. THIS IS WHY THE SKIN REQUIRES REGULAR, DAILY CARE THROUGHOUT ITS LIFETIME TO REMAIN HEALTHY AND RETAIN A YOUTHFUL APPEARANCE. Facial treatments, proper makeup techniques, and daily care can maintain the health and attractiveness of the skin for a lifetime. alcohol - over dilates blood vessels and therefore weakens capillary walls causing them to burst and discolor the skin. Dehydrating. drugs - can interfere with the intake of oxygen which the body needs for healthy cell growth. tobacco - contracts blood vessels, decreases circulation which deprives skin of essential nutrients and oxygen. frequent weight gain and loss - skin is over stretched and cannot recover when rapid weight loss occurs. Premature wrinkling and sagging can occur from this cycle. excessive massage - can weaken the collagen fibers, resulting in wrinkling. Facial exercises that include exaggerated facial expressions can contribute to weakening these fibers as well. gadgets and overrated products - proper diet, rest, good health habits, along with everyday care of the skin are still the best preventative measure against wrinkles and other signs of aging. 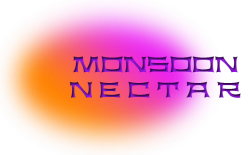 MONSOON NECTAR, or NECTARS as a collective term for Monsoon Nectar products, is enriched with therapeutic essential oils, botanicals, and antioxidants. For both men and women, the NECTARS are a natural, healthy approach to care for your skin, hair, and body. The Nectar’s molecular weight is compatible with the cells of our skin so it is able to penetrate the skin deeply. Liposomes restore moisture and penetrate regenerative nutrients like vitamins e, c, and beta carotene, omega 3, 6, 9, ester-c and alpha lipoic acid deep into the cellular level. Basically, the Nectars stimulate and support the natural healing system in your skin. You can feel the product assimilating into your cells, completely absorbing yet creating a barrier against further drying. The effect is velvety instead of greasy. The NECTARS boost your immune system to promote healing, reduce scars, stimulate the skin’s natural ability to produce collagen, protect against sun damage, reduce and sooth roughness, cracking, and irritation. This synergy is also a powerhouse against free radical damage which is directly related to aging. Neutralizing free radicals, repairs and diminishes early signs of aging due to free radical damage, dehydration, and environmental stress. Anti bacterial, antiseptic, anti fungal properties guard against rancidity without using chemical or synthetic ingredients. The Nectars are further resistant to bacteria because they do not contain water. Only the hydrosol mists, which are steam distillates, should be treated as perishable and can be refrigerated or kept in cool dark place. All other Nectars have a 1-2 year shelf life. The original, medical apothecary came from plants and herbs, exactly where essential oils come from. It only makes sense to use natural botanicals and therapeutic essential oils on the skin for daily skin care for their medicinal and therapeutic effects. The NECTARS contain properties and aromas (AROMATHERAPY) specific for treating different ailments on many different levels of a person’s well-being, physicality, and emotionality. Just like antibiotics, you should take a break, after a couple of weeks, and switch to another Nectar. The cells and immune system get used to the therapeutic properties of the essential oils and build a resistance so the essential oils become less effective. You hear this in regard to the use of Goldenseal or Echinacea, if you are familiar these herbs. That is why there are seven Chakra Aroma Antiox Moisturizers to choose from (nectar chart) and it is best to rotate their usage for potency and the different benefits. The NECTARS work instantly and the anti-aging effects are cumulative with consistent use. Effective skin care does not have to be unaffordable. In the spectrum of cosmeceutical grade products the Nectars compare less expensively and do not contain carcinogenic ingredients. All of the NECTARS are formulated for potency using maximum percentages of essential oils and botanicals. The efficacy of the NECTARS and the restorative and therapeutic benefits directly relate to this potency. The NECTARS are 100% natural. To ensure the potency, keep the NECTARS out of direct sunlight and in a cool place. The word “fragrance” on an ingredients list is used as a collective term for a myriad of synthetic chemicals. These chemicals try to duplicate the smell of natural aromas but cannot duplicate the health benefits. Natural aromas are indicated by the words “100% pure essential oils” and have therapeutic benefits to the body. Today many people have become chemically sensitive due to the use of fragrances in personal care products as well as household cleaners, air fresheners, laundry products, and pollution in general. Your liver knows the difference and is taxed as it tries to process and filter out these chemicals, causing great stress to your body. MONSOON NECTAR Potent Botanical Moisturizers are naturally pure formulations of botanicals and 100% pure essential oils. Preview the GLOSSARY and learn about the benefits and physical properties of the essential oils and botanicals used in MONSOON NECTAR.